The Buzz on Bees: Why Are They Disappearing? by Shelley Rotner and Anne Woodhull. (Grades 1-4.) Holiday House, 2010. Review copy provided by my local library. This title has been nominated for a Cybils award. This review reflects only my own opinion, not the opinion of the panel. The bees. Since 2003, they have been disappearing en masse and nobody's quite sure why. Why is it important? Well, bees pollinate things. Things like fruits and vegetables. Bees may be small, but their impact on the environment is huge. Plus, bees dying off may be a sign that our planet is not healthy! 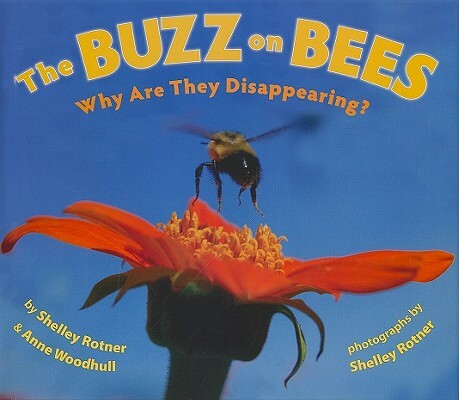 In The Buzz on Bees, authors Shelley Rotner and Anne Woodhull examine the effect bees have on the environment, some theories as to why the bees are disappearing, and what we can do to help. Vivid photographs capture bees of many different types - yes, honeybees are disappearing, but many other native bee species are declining as well. One thing I found interesting was information about the different types of bees and what plants they pollinate particularly well. The authors present many different theories to the bees' disappearance - disease, stress from transportation, diet, loss of habitat, etc. There's a nice section with tips for kids on what they can do to help bees and the environment in general, and there's an extensive list of web resources for further information. The photographs are stunning and colorful and they'll be clear crowd-pleasers with kids. The text is accessible and simple enough to share with lower elementary students, though older students will get use out of this book as well. If you've got students who are not quite ready for The Hive Detectives by Loree Griffin Burns, this book will do quite nicely. The Buzz on Bees is on shelves now! Happy Nonfiction Monday! Check out this week's roundup at In Need of Chocolate!